Ron joined the NCSA middle school team in 2018. Before coming to Nevada City School of the Arts, Ron was a middle school teacher for several years at River Oak Charter School in Ukiah, CA. 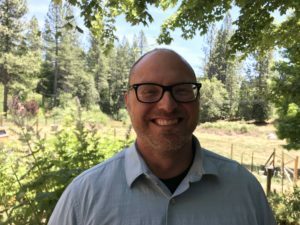 He has also served in various contexts at Yuba River Charter School from middle school teacher to administration. Ron and his wife, Cheri, moved to Grass Valley from Mendocino County in July 2007, just one month before the birth of their son, Cyrus. Ron received his Bachelor of Arts degree from Berry College, a small, private liberal arts school in Northeast Georgia, where he studied English and Art. Ron holds a Clear Multiple Subject Teaching Credential with a CLAD emphasis and a Supplementary Single Subject authorization for English / Language Arts, as well as a Master of Education degree from National University in Sacramento, CA. Before coming to teaching, Ron spent several years traveling throughout the world and now continues to explore the world with his family. Ron enjoys playing guitar, writing songs, and singing. He loves spending time with his family in the mountains, backpacking, and snowboarding, as well as caring for their goats, lambs, and garden on their small family farm. Through the creative lens of artistic exploration, the 8th grade will utilize project-based learning, hands-on investigation, discussion, and analysis to delve into the subjects of History and English / Language Arts. Over the course of this year, we will be covering the history of the United States of America as well as the geography of the country in which we live. We will consider and analyze the major ideas, issues, and events that shaped the founding of our nation and continue to help form our country. By investigating the American Revolution, the Declaration of Independence, and the U.S. Constitution, we will explore the beginnings of our country and our government. Moving through the year, we will look at other major events including the Civil War, westward expansion, and the Industrial Revolution, moving into modern, current events, technology, and the many important issues that we face today in our ever-changing and diverse country. We will begin this year with the art of the short story, examining a variety of genres, authors, cultures, and traditions. Through investigating different literary techniques, we will learn to analyze these stories with a critical eye. We will also be spending a significant amount of time with creative writing in two very different forms - persuasive writing and poetry. Persuasive writing allows you to use your words to share an opinion or to persuade your reader through your use of words. This incredibly important skill will be a center point for much of what we will do throughout the year, honing composition and essay writing skills into excellence, while also bringing these skills to the realm of public speaking and debate. We will also spend time with the art of poetry. We will explore numerous styles and structures, from ancient to modern, from a highly structured Shakespearean sonnet to the free verse of Walt Whitman, to the rhymes and rhythm of modern hip-hop.